In 1946, a lawyer, author and writing consultant named Rudolph Flesch “started a revolution in journalism and business communication,” writes William Dubay, a readability consultant for Plain Language Services. 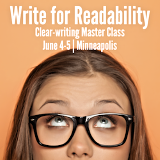 That’s the year Flesch published his first readability formula in his dissertation, “Marks of a Readable Style.” Publishers found that the formula increased readership by 40% to 60%, Dubay writes. There are plenty of formulas that measure the readability of text, from the Dale Chall to the Fry Readability formula. But that early Flesch test — along with the Flesch-Kincaid Grade Level and the Gunning Fog Index — are among the most frequently used in government and business. So what’s behind these big-three readability formulas? What do they mean? And how can you use them to make your messages measurably more readable? The Flesch Reading Ease index is that early creation of Rudolph Flesch, author of Why Johnny Can’t Read. It computes readability based on the average number of syllables per word and the average number of words per sentence. Multiply the average number of syllables per word by 84.6 to get A. Multiply the average number of words by 1.015 to get B.
Subtract A from B to get C.
Goal: Aim for 60 or higher. Scores range from 0 to 100. The higher the score, the easier your copy is to read. To increase your score, reduce the length of your sentences and words. Who uses the test. Flesch’s work with the Associated Press helped bring the reading level of front-page newspaper stories from the 16th to the 11th grade. Today, this Flesch test is one of the most widely used, most tested and most reliable readability formulas. U.S. Department of Defense, many government agencies and the state of Florida are among this Flesch test’s fans. In 1976, the U.S. Navy commissioned J. Peter Kincaid and his team recalculated the Flesch Reading Ease scores into a grade level. Then, Kincaid’s team worked to validate the new scores across two measures: 1) comprehension on Navy training manuals and 2) learning time. The resulting readability formula — The Flesch-Kinkaid Grade Level — measures how hard your copy is to read. Multiply the average number of words by 0.39 to get A. Multiply the average number of syllables per word by 11.8 to get B. Add A to B to get C.
Goal: Aim for 8th grade or lower. Scores range from zero on up. To improve your score, reduce your average sentence length and word length. Who uses the test. The U.S. Army first used it for assessing the readability of technical manuals in 1978. It’s now a standard for the U.S. Department of Defense, the Internal Revenue Service and the Social Services Administration. Pennsylvania was the first state in the United States to require that automobile insurance policies be written at no higher than a 9th grade reading level, as measured by the Flesch-Kincaid formula. That’s now a common requirement in many other states and for other legal documents, such as insurance policies. In the mid-1930s, textbook publisher Robert Gunning realized that much of America’s reading problem was actually a writing problem. He found that news and business writing was full of “fog,” or unnecessary complexity. He developed the Gunning Fog Index in 1952. How to run the test. The Gunning Fog Index measures readability based on sentence length and word length. In reality, you’re probably going to use a tool like StoryToolz to run this formula. Count out a sample of about 100 words, ending with a complete sentence. Count “hard words” that have three or more syllables skipping proper nouns, compound words and those that are three syllables long because of to a suffix (e.g. “ed”). Add your average sentence length to your number of long words. Goal: Keep your score in the single digits. Keep your reading grade level to nine or below. That sounds low, but most of the publications you read every day are written at that level. How do popular consumer publications stack up? 15, 14, 13 College junior, sophomore, freshman No popular consumer publication is this difficult. Source: Gunning-Mueller Clear Writing Institute Inc.
To improve your score, make your sentences and words shorter. Who uses this readability formula. Gunning worked with the United Press, helping bring the reading level of front-page newspaper stories from the 16th to the 11th grade. He also helped The Wall Street Journal reduce its level from 14th to 11th grade. In the process, the Journal’s circulation rocketed from less than 50,000 to more than 1 million in a decade. How can you use these big-three readability formulas to increase readership and move people to act? Gunning-Mueller Clear Writing Institute Inc.